Wow, what a weekend. I just want to start by thanking everyone for coming along to the weekend in York. I for one, had an outstanding time! I want to do a detailed write up of the weekend for those of you that couldn’t make it and for those of you that went and want to reminisce a little. If the weekend were put into human body parts (stay with me), I think the the journey up to York would be the ‘Arse Hole’. It was a bloody nightmare for us and many others. We set off at 10.00am, and the Sat Nav indicated that we would get there at 1.30pm. The weather was very poor for most of the UK. The persistent rain and Friday traffic resulted in numerous accidents and gridlocked traffic. We encountered 5 separate stop and go traffic jams, and we eventually got to our hotel at 3.15pm (5hr 15 mins later). My back was drenched with sweat from the heat and traffic frustration, but Lou and I quickly got ready and walked into town to meet the FIREstarter who wisely drove up the night before to Sheffield to break up the Journey. He made it to York just after 1pm and took to touring the town with his wife. We called them when we reached the town centre, and they were having a coffee in a Teddy Bear shop cafe. I thought he was having us on for a minute but when we saw the shop we noted the appeal. We joined them as they were finishing their tea and it was nice to finally speak to him in person (and his wife). We decided to move onto another location with more seating as we had more people joining us soon. The FIREstarter led us to bar that was nicely tucked away in a side street, it was called 1331. We bought our first drinks for the weekend and got busy getting to know each other. It was interesting to get to know him more closely than our previous correspondences by Blog comments and personal emails. It was great to hear about his work and future plans. Within 20 mins or so, I received phone calls and texts from people on route wanting to know what the plans were for the evening and where to find us. Weenie, from Quietly Saving was the next to arrive. Grinning from ear to ear, she grabbed a pint of Ale (not a patch on hers! ), and joined in with the chatter. Emma was the next to join us. She works in Risk Management and is an avid Blog reader. She has a huge amount of energy and enthusiasm, and brought with her a wealth of knowledge and experience on frugal living, investing and knowing how many people could die from an explosion in a building. True story! After we had gotten to know each other a little more, the conversation quickly got on to the topic of investing. It was at that moment that I had that first “This is brilliant” thought. We were all gathered around enthusiastically talking about investing and it was so refreshing. It was part of what the weekend was all about. My journey wasn’t great, but a couple had an even longer journey from a location further away from York than Herefordshire and it took them 6 hr 15 mins to get there! Ouch! A&L are a resilient pair and brushed aside the journey antics now that they were in York at a bar. We decided to move on once again as some more people confirmed they were joining us for an evening meal. A, of A&Z, is a Blog reader. He was the numpty that turned up to my first Gathering in the UK, at Symonds Yat, on the wrong day (after driving 40+ miles)*. We have since met up in person and got to know each other a little more through emails. *Sorry A, had to do it! We were expecting 11 people to join us for the evening meal, and the 8 of us who were present, headed for the river to see if we could find a nice restaurant that could accommodate everyone. We got to the river anyway…..
Out location was Yates’ Bar. If restaurants were body parts, Yates’s Bar would be……. Yes, you guessed it! Why did we choose Yates’s Bar? Between the 8 of us, we had little to no knowledge of York and we needed 11 seats at short notice on a Friday evening. It served it’s purpose anyway. We grabbed a huge table, and within 2 minutes of being in there a group 4 guys asked us if we wanted to take 4-5 bowls of chicken wings. It looks like they were trying to complete an eating challenge and had failed miserably. Being the frugal folk we are, we took them up on there offer. Starters sorted! Before we put an order for food in, we were joined by Blog reader Richard and his wife Alison. They joined us in SoA in March, and Richard has regularly left comments on the Blog for some time now. Richard is one of the most frugal people I’ve ever met, and his astute saving and investing has put him and Alison in a position to retire from work next November. Richard is also trying out Kindle Publishing as a side income, so we both had plenty to talk about. I can’t forget Alison, as she booked the room we were in for the next day at the Stonegate Yard after carefully scanning the town for suitable locations. She’s a natural organiser and was a great asset to have on a weekend like this. She did a fantastic job! After 30 mins or so of chatting away we decided to order food. Most of us opted for the Yates’s selected menu, which offered a reasonable ‘2 Meals for £8.95’. After consuming our frugal meals, it became apparent that we might need to move on from Yates’s Bar. The disco lights came on, the music volume went up, and so did the lary behaviour. Chants of “Dave, Dave, Dave…..” were being called as a lad started downing a pint. I made an ultimatum to the group to that we should either rapidly move on, or hit the dance floor and tear it up. If you can’t beat them…. Jim took us to a more respectful side of town and to a pub called the ‘Duke of York’. Alison managed to reserve a table for 11 with her influencing skills, and we were set for the evening. Jim wrote a great tongue in cheek article on the pitfalls of retiring early on EarlyRetirementGuy, check it out if you haven’t already. Jim was partly forced to retire early at 51. It was great to get a perspective from someone that was living the life most of us desired. The drinks were flowing and we all chatted away about frugal living, investing and FIRE. It was fantastic! The Duke of York – Jim McG and I were in a compelling stare off contest. The FIREstarter was topping his pint up with imaginary beer. No-one went too crazy one Friday night. We wanted to reserve energy for the following day and we had the whole weekend to go. People started leaving around 10pm to get back to their hotel rooms. Lou, Emma, Weenie and I all walked home as our accommodation crossed each other. It was a great first day overall. It was also nice to know that we had another 2 days in each others company. The FIREstarter and I agreed the night before to go for a morning jog to shake off the cobwebs, spend some time together and see a little bit more of York. We agreed to meet outside Yates’s at 7.45am as it was in between our accommodation. I took a gamble and decided not to take my phone with me as I didn’t want my Galaxy SII flying around in my backpack. It turns out he got there on time and text me to let me know. Rather than standing still waiting for me, he decided to warm up and jog up and down the riverside and suggested calling/text him when I arrived. I knew none of this of course. So we just missed each other and I waited there for 10 mins instead. My fault! After 10 mins had passed, he thankfully decided to go back to Yates’s and see if I was there – Sorry TFS! If running partners were body parts, I think I would be classed as the ……. Jim McG suggested a nice route next to the river out of the centre so we went with that. I didn’t time or track the distance, but I think we did around 3 miles at a guess, perhaps more (TFS might have tracked the run). It didn’t matter, our run consisted of non-stop talking about each others current situation at work, how we got to where we are, the challenges we faced, and our future plans. I thoroughly enjoyed the run. The location was great (Thanks again Jim! ), and I really enjoyed TFS company. He’s a top bloke and I hope I can get to know him a little better through these gatherings and further email exchanges. Once we’d finished the run, I took an unintended 10 min detour as I lost my bearings but managed to back on track and made it home around 70 mins after I set off. Once showered and changed, I did a little work on emails, Kindle, Blog comments, and relaxed. It was bliss. For what it’s worth, Lou and I were very happy with the accommodation at the Moorland House, Fulford. It cost us £144 for 2 nights, and served us very well indeed. Lou and I agreed that it was one of the best short break accommodation bookings we’ve made for the price. Thank you Tony! I would highly recommend it and use it again if in the area. Lou and I walked into York and had a general look around the town. We agreed to meet up with Weenie, and A&Z at 11.30am for a quick walk around town prior to the meet. The sky was blue, the sun was shining, the streets were busy and town was buzzing. I quite quickly appreciated the beauty of the city, and for anyone that hasn’t been to York, I would highly recommend it. The cobbled streets, the old buildings, and the quirky shops. York has a lot to offer. I was stopped on 3 separate occasions by some foreign students (Dutch, I think), asking if they could take a photo of a man with a beard. I duly accepted! We slowly wondered around the streets of York before bumping into Emma and we then headed towards the Stonegate Yard for the afternoon events. After our morning meander, we headed to the Stonegate Yard for the afternoon. Richard and Alison were already there. I thought we were in the outside garden room, but I didn’t realise that we had booked a room which was almost secretly tucked away to the side of the outdoor space. The room could comfortably accommodate all of us, with some spare seating if needed. We were cut off from everyone else at the location, and they were cut off from us! It was our own space, and yet another great suggestion from Alison. One by one, people started arriving; Mike, a Blog reader, was the next to arrive. He texted me to say he was sat in the outside garden room. I walked into the garden room and tried to find someone that was sitting on their own. Luckily there was only one person sat on their own, so I fancied my chances! We introduced ourselves and I walked Mike into our room. I know we’ve only done a couple of Gatherings, but what I love about this group is everyone’s welcoming nature. I haven’t been to one on my own before, but I can imagine it being a little daunting for some people, not knowing what to expect. Mike was welcomed by everyone, and quite quickly settled in. Mike works in IT, and came to us in a different position to most other attendees. He’s currently in a Debt Reduction phase, which he hopes to finally clear in November this year. I’ve asked Mike to keep us all posted on this Blog when he manages to clear it. Congratulations to Mike for taking this on! This was my first steps several years ago and I haven’t looked back since. For anyone considering coming to future Gatherings, please don’t be concerned about having to have a huge Net Worth, your knowledge gap on investing or frugal living. All you need is an interest in these areas and meeting people. I’m a firm believer that everyone can learn something from everyone if you’re open enough to learn. Mike captivated a crowd early on when he was talking about how he looks after his multiple passwords (over 100! ), and what apps he uses to manage it all. Craig, another local from York, was the next to arrive. Craig is 6′ 6” so he had to duck to get into the room. He asked if this was the UK Gathering, we said “Yes”, and “Hi”. He said “I’m Craig. Hi everyone. I’m going to get a drink” and ducked out of the door again. It was a swift introduction, but he does work in economics. He executed the fastest introduction and drink purchase out of everyone! Craig is in his mid 20’s and is new to to FIRE scene. Craig studied Economics at University and now worked in the field. the topic of FIRE is a natural pull for people in this industry. I noticed that he regularly used terms like ‘cost-benefit analysis’, and ‘opportunity cost’. He had just completed his first (and only!) Ironman event in the past month, and he’s now ready to conquer the financial world. We had an influx of Bloggers arriving, first of which was M.
M will verify, but this little man is less than 2 years old, and he already has a pension. I think he can make FIRE before high school! The FIREstarter was the next to arrive with his wife. They had a nice walk around the York walls before meeting up with everyone. Cerridwen, wrapped up the afternoon visitors, she’s from Keeper of the Cauldron. Cerridwen was brought up in the area, and although she’s moved away, she still know’s York very well. She took the train in, and was only able to stay with us for a few hours. I only managed to catch her very briefly during this time. She has a lovely disposition, as I imagined, and I only wish I could have talked to her a little longer. Hopefully, I’ll get another opportunity at a future Gathering. Now that everyone was present, we could sit back, relax, drink, eat, and enjoy each others company. We could talk about FIRE all day! Weenie brought out a bag which contained tiny pieces of paper. She printed a list of all the companies within the FTSE 350, and cut out EVERY SINGLE ONE OF THEM. Each slip of paper was carefully folded twice and to her credit they all looked alike. This 2 week task came to fruition when the draw commenced. Weenie asked me to go first to kick things off and I happily obliged. It felt like the live draw for the 3rd round of the FA Cup, and things felt slightly tense as I drew out each company. There were ohh’s, ahh’s and “Who are they?”, and it was wonderfully rounded off by a round of applause. The premise of this game is to have a bit of fun around our field of interest – Investing. It’ll be interesting to examine the success of companies based on pure luck. I have no doubt someone or at least a couple of people will have an awesome year, it’s inevitable. What will the average be like? How will our selections fair against the FTSE 350 or FTSE 100? It should be interesting. I like the game for another reason. It raises your awareness of companies you’ve either never heard of, or know nothing about. I now know more about the companies I invested in than I did before. This can’t hurt my ‘real money’ investments. I picked 5 companies and Weenie made a note of all of them. I’ve added a little twist to the competition by challenged myself to select 5 companies within the FTSE 350 to see if I can perform better than the companies from my live ‘Blind draw’. Gulp! Can I beat it?! You’ll have to tune into Quietly Saving to find out! I have to send out another big thank you to Weenie for going to the trouble of creating everything. It was nice to have something for all of us to focus on during the day as well. Great job Weenie! After the group photo we said goodbye to Jim McG and his wife, and we headed to La Tasca’s roof terrace for some sunshine, Rioja, Sangria, San Miguel and Coffee. The coffee order got booed, especially as it was the last order at the table, but ‘A’ shook it off like Taylor Swift and rightfully stood his ground. In our eagerness to reach the rooftop terrace, most of us missed saying goodbye to M. We didn’t realise she was leaving right after the photo and most of us proceeded to La Tasca. Sorry M! I hope you enjoyed the afternoon and had a nice journey home. We stayed at the bar for around 60-90 mins or so (I wasn’t counting), and headed off to town for more drinks and some food. Craig took on the mantle of tour guide in Jim’s absence and leaded us to a much more simple food option – Hog Roast! I had a Pork roll, with stuffing, crackling and Apple sauce. It barely touched the sides. Once fed the ‘Titanic 10’ moved on to what was now the closest thing we had to a local – The Duke of York pub. We once again negotiated a table to fit us all on, and this would be our final stop. 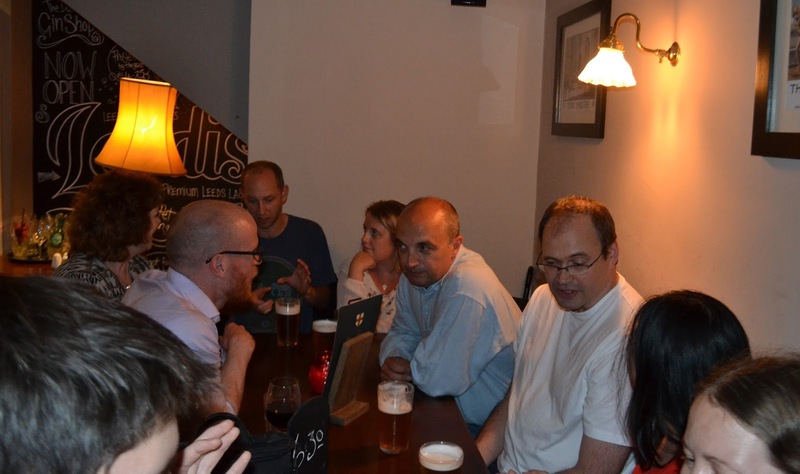 The pub had a lovely atmosphere and easily allowed conversations on a one to one or group basis with little effort. The conversations ranged greatly at the DoY from Investing, saving, frugal living, challenges, match betting, cashback, bingo, Ironman, climbing Everest, exercise, and the Drug Olympics. Emma’s creativity poured out when we touched on drugs in sport. She’s quite game for seeing all athletes go hell for leather and use whatever they want to destroy the current crop of records. There would be no need to worry about drug testing and we could see freaks of nature competing against each other. We’d see 8 second 100m sprints and two headed athletes. I think I would extend my monthly budget to watch some of that stuff if I’m being honest. As I mentioned above, we discussed some great financial and non-financial topics too. It had been a great day, but I was tired. At around 11pm, most of us decided to call it a night. A&L, Emma, Lou and I agreed to meet on the Sunday morning to walk the walls, and we planned on meeting Richard and Alison a little later. We said goodbye to Weenie, Craig, Mike on the night itself. Our numbers had dwindled but out spirits were high. The Frugal 5 – Emma, A&Z, Lou and I met in the morning and headed towards one corner of the York walls Craig recommended – The top right if you’re interested. He said this is the most interesting part of the wall, and you get a great view of the Minster. We ended up covering half of the city wall walk, and that was enough for us. We were well and truly ‘walled’ out. During that 60 minute (or so) walk the topic of conversation mainly revolved around the Gathering itself. What people thought of it, what they liked, what they would change or some other different suggestions. It was great to hear some open feedback on the weekend. We met up with Richard and Alison, grabbed a coffee and headed to the park to discuss the weekend in more detail. This was the last phase of the weekend and I thoroughly enjoyed it. It was great to hear everyone’s thoughts on how they’d like it to run in future. There was plenty of love and enthusiasm, but also an feeling that they could be even better. There were some common themes from those of us that were left at the end, and I’d like to share some of these with you now. Frugality – We should make the weekend generally more frugal. We don’t have to kill a cow and cook it, but provided food, drink and leisure activities would be more in line with what most of us live like and believe in. These weekends have turned out to be quite expensive so far. Activities – The socialising and learning has been a great element to the weekend. Some attendees would like to incorporate some low key activities to break up the day – kicking a football around, frisbee, jenga, croquet, rounders etc. Consolidate Learning – Most people discuss learning points they’ve picked up over the weekend, but we’re not all privy to everyone’s conversations, and a chunk of us miss out on some great pearls of wisdom. Some attendees requested informal chats on certain topics – Richard volunteered to discuss how he invests, I would be happy to discuss Kindle Publishing, someone else could talk about everyday Frugal Living. People could attend the chats at their leisure or skip them altogether. We could have 2-3 speakers on each topic followed by a Q&A at the end. Each discussion would have plenty of free time in between to chill, relax, drink or sleep, so it didn’t feel like a seminar. Here are some of the topics that came up and might interest you – Frugal Living Tips, Making Management (Investing, P2P and Saving accounts etc), Making Money (Kindle, Blogging, Property Management etc), Motivation & Productivity tips. Location – Town/City locations are great, but could we hire a location cheaply where we were the only people present. Ideally it would have some outdoor space, breakout rooms, self catering facilities, and rooms for all of us to stop in. I know we’re asking a little much here, but if we could meet half or some of those requests it would be brilliant. Did you miss this Gathering? Do you still want a say in future ones? No problem, please leave a comment below of what you’d like to see and experience. We have 2 UK Gatherings under our belt now. They’re growing each time, and I really like the way they’re progressing. It was nice to see the familiar faces again. I’m starting to feel like I have a new groups of friends now, and I’m looking forward to spending more time with everyone again in future. It was equally exciting to meet new people from all walks of life, so please don’t let my thoughts put you off. I thoroughly enjoyed my time with all the ‘first timers’. The next one will be ‘Dan Sath’, in early October with the exact location and date to be confirmed. I’d like it to be in a neighboring county to London, that’s all I know right now. Any suggestions? Thank you once again to everyone that came out to meet us. I hope to see you all again very soon! I am headed to the UK next June and I really hope there happens to be a get-together I can swing by. This looks uproariously awesome! Thanks for stopping by! Great to hear you're stopping by in the UK next year. I usually plan one Gathering at a time, so I'm likely to start looking at the summer 2016 one in March/April next year. I hope our dates cross over and if you're still following the Blog next year, let me know your dates closer to this time and I'll see what I can do – especially considering you're coming from Alaska! Both myself and Alison thoroughly enjoyed our weekend and got a lot out of it. Everyone we met was so nice and welcoming with some incredible stories of their journey so far and their plans going forward. I listened in admiration (and a little envy) to A&Z as this couple in their 20's told me about their house renovation and their plans to reach FI in 10 years. Emma's incredible enthusiasm in everything she said, her can do attitude and her drive for FI was infectious. I am all up for some activities on the next gathering although I think I will give the crochet a miss as I am not too good with wool. Croquet on the other hand is not something I have tried but fancy having a go. We floated back to the Yorkshire Dales on a massive high full of drive and enthusiasm (yet still managing 70+mpg) and discussed what a wonderful bunch of people we had met. Really enjoyed the weekend, but was mostly sorry to not get to spend more time with everyone and speak to more people (as well as say bye!). My little man has indeed got a pension, as well as a cash JISA and a stocks & shares JISA – he'll beat us all to FI!!! Really like all the suggestions, will fill in the survey. Once again thanks for organising the weekend – I had a great time and met some lovely people (just sorry I didn't really get round to chatting properly to everyone – time flies etc!). I've filled in the survey – I think you've got some sound suggestions above and can't really think of anything more immediately – I'll ruminate on it and get back to you if my limited cognitive powers come up with anything. Personally I doubt I'd be able to make the south meetup (you never know) but I'm really looking forward to any more mid-northern ones! It's already been mentioned by others but the meeting up venues could have be a little more frugal. Parks, public places, or whatever is to hand. Obviously this depends on weather and Friday for example would have been scuppered so maybe it would be good to have a plan A and a plan B depending on what the weather is doing? I like the idea of activities as well, that seems like a fun idea. As long as they are free/cheap obviously 🙂 – again rather weather dependent if it's outdoor stuff but worth making plans for it either way. Thanks again Huw and everyone else for being so nice and welcoming and sharing all your stories and tips with me! P.S. sorry for the little one's spitty handshake! Great write up and looks like you all had an awesome time. Very much hoping a Southern one does go ahead and that I can attend. Unfortunately due to business commitments I missed this one, I know I've two events in October, but hopefully your next meet up won't conflict so I can attend. The report back from yourself and FIRE Starter has only made me more enthusiastic in my FI abilities and networking with you guys! Sounds like a great couple of days. Unfortunately it would be a sizeable trek for us to join you guys. How about a periscope stream for the next one? Thanks for a great detailed write up of our excellent weekend! Thanks all who took part in the Monkey Stocks League draw – don't forget I need names for your portfolios! I've already started to read up on some of the stocks that other people have drawn out and added a few to my watch list! I filled in your survey, but have thought of other things since then. I like the idea of things being more frugal – York wasn't cheap and I can see why it goes against the whole frugal ethos, although I saw it as a holiday weekend, so didn't mind, it was in my 'entertatinment budget'! I'm also up for any sort of activity. However like TFS and Cerridwen, I prefer the casualness of it all. I got enough info from just talking to people, getting to know them – as TFS says, otherwise, it could be too much like work! Maybe one suggestion for a bit of fun though (which we did try at work successfully) was an idea based on speed dating – bear with me….Over the weekend, I think I was able to chat properly to most people but there were a few that I didn't really get a chance to talk to much. Mingling can be a difficult so with the 'speed dating' idea, you get a few minutes chatting to one person, then your time is up and you move on to the next person. You might only just swap pleasantaries, basic details but it breaks the ice. Might take a bit of organisation but when we did it at work, it was a lot of fun. I got chatting to people I see every day in the office but never knew their names or what they did – I know now! Thanks again Huw for organising this – not sure I'll be able to make the next one but I look forward to attending future gatherings. Great summary of the weekend and all credit to you for organising it. Judging from the feedback, everyone found it enjoyable and motivating too. It's a real challenge to get the balance right on informal get togethers, and I like some of Weenie's "speed dating" suggestions for the next one – sometimes at work conferences, we'd swap dinner seats between courses in an effort to get to know people. I'm sympathetic to Alan's (Firestarter's) observations too – the last thing we want is to make these things seem like work! But, on the other hand, it's really interesting to hear about other people's experiences of investing too. I haven't filled out your survey yet, but I'll think about this and put any suggestions in there that I have. Finally, suitably inspired by the group, I've started to write a blog about my Early Retirement experiences. I'm trying to build some content for it over the next few weeks and hopefully I'll be able to keep it up. At least I've got time to do it! Sounds like it was a great weekend and also that you organised it brilliantly. Have you any thoughts on where your next meet might be? Great to hear that you both took so much from the weekend. They're a great great bunch people I have to say! Ha ha. Thank you for highlighting the typo, although I see nothing wrong with a bit of wool work to wind down. Likewise Richard, I can't wait until the next one. The only downside is I'm going to have to organise it very soon as September will be upon us very soon. I'm looking forward to seeing you both again soon! PS. Please pass my thanks onto Alison for her help over the weekend. She was a superstar! Great to hear you enjoyed the weekend. It difficult to spend quality time with everyone. The time passes so quickly. I find I'm in an in-depth conversation with someone and an hour flew by. If you were there for 4-6 hours, that doesn't give you a lot of time to have those meaningful conversations. I'm not concerned with the Little one's spitty's hand! It's an honour. He's going to be a highly successful person in time to come. I just hope for his sake he learns to stop the habit growing up. It was awesome Tawcan! If you're in the area in future, please let us know! My pleasure. Thank you for coming! Great to hear that you took so much from it. Thanks for filling in the survey and please let me know if anything pops into your head. I haven't looked into the south location, but I appreciate it will be a trek for you. The spring one will be back in the middle somewhere. I look forward to meeting you again in future at some point. Please let us know how you progress this year. Thanks for kind words, doing the survey and coming along for the weekend. Please thank your other half for coming along to, especially as it was more for you than her. Great to hear that you enjoyed the weekend. Thanks for sharing the survey answers here too, so others can see. I think I'm going to have more of a challenge on my hands for future gatherings. Once you ask for 20 people's opinion's on how you should organise things you get consistent messages, and extreme opposites. I'm going to address these in a Youtube video along with the survey results. I thoroughly enjoyed the run with you, and it would have been nice to speak to you for another hour or two personally. I look forward to catching up with you on Skype in the upcoming months. I'm up for working out at the next one too. You're very welcome. Thank you for everything you brought to the weekend. Not to worry, I'm hoping to make them a regular feature (2-3 times a year). I can't promise to select the weekend that you're free, but I hope for both of our cases it is. It would be great to meet you. It's important to me that we keep a core of 'regulars', and we have as equal amount of 'first timer's. Both have so much to offer everyone. I want to overall feel of the weekend to be laid back and flexible. I plan on putting a few more things in place in future but not much. People can come and go as they please and that's important to me. I look forward to seeing you again and hopefully spending a little more time getting to know you more. Thank you once again for coming along. I had an awesome time and the comments have been very positive thus far. I plan on getting the ball rolling with the one down south soon. I hope you can make it! It was brilliant from my end. I hope you can make the next one too. Likely to be early Oct. It was a brilliant all around. I would love to film the whole weekend, but people feel strongly about keeping their identity hidden and I respect that more than serving that desire. I like the challenge it presents and I still think I can work around it by filming myself in sections, it just won't be the same as being there though. Leave this one with me…. My pleasure Weenie. Thank you again for coming along and doing the monkey picks. I thought that was a great addition to the weekend. I enjoyed spending more time with you in York and getting to know you a little more. Blinda Apa – for the picks I did in York. Thank you for doing the survey and for sharing your afterthoughts. The frugal idea has been unanimous from everyone – No shocks there. The talks have represented a real split. It's difficult to meet everyone's needs but I believe there's a way of putting in the talks without making them formal, and giving everyone else an option to do other things. It looks like that point in particular will split the crowd, but that's ok. Cerridwen, Jim McG and TFS will be in the same position as you and you can catch up when the talks are on. When I say talks – I'm thinking 1-3 max spread over the weekend. They aren't going to involve presentations. More that a person who knows a lot about a topic can share their knowledge. Ie. Richard has suggested sharing how he selects stocks and answering questions from others. I for one, wold LOVE to hear that! I like the challenge of being able to meet the needs of both sides, and I think they'll be enough people that feel strongly about either side that it won't be a case of people being on their own. I want everyone to get the most they can from the weekend. If that means chilling/relaxing and chatting or if that means walking away with some stock picking knowledge and having questions answered, why can't we do both! I think the speed dating is a great idea by the way. I'd like to implement that at the start of the main day. Thank you for sharing it! I might be coming back to you on this one for more details. You're very welcome. Thank you for coming along. It's a shame you can't make the next one, but I'll do my best to share it with you and there'll be plenty more! Mu pleasure. Thanks again for saving us from Yates' and giving us some guidance over the weekend. I'm aware that now I'm asking for feedback on where people see these Gatherings going, I have a huge challenge to meet a lot of those needs. My keen take away's are making it cheaper. Keeping it much more frugal. Keeping it relaxed. Maximising all of our knowledge and sharing. I feel confident that I can deliver this! Greta news on the Blog front Jim – Please drop me a note when it's up and running and I'll be happy to check it out and share it with everyone else. Exciting stuff and good for you! You won't regret it. I thought it was brilliant, and I've heard a lot of positive feedback so I'm pleased. The next location is TBC, but it will be in a county next to/close to London in early Oct.
Hope to meet you at one of these at some point! Sounds like it was a great weekend. I have visited York before and know it can be a bit expensive, having a local around who can find the more frugal and quieter less touristy spots can be a real help. I couldn't make this event, clashed with other plans, but will keep an eye out on the dates for the next one. It sounds like it is a great opportunity to put faces to blog IDs and still keep some anonymity. Hmm..Richard talking about his stock picks would be something I'd be interested in! Thanks for organising such a great weekend. For anyone unsure about joining the next one: you should do it. Don't worry about arriving alone or not knowing enough (or still being in the FI closet). Everyone was amazing and the weekend was really inclusive. I learnt something from everyone that I spoke to and left with some great things that I can do to help me on the way. Jim – love the blog name, I assume they are in priority order? Was great meeting everyone, had a great time and enjoyed some really interesting discussions. Athlete doping, climbing Everest, kindle publishing, investment strategies! I will play the next one by ear, but will hopefully make it! It was a fantastic weekend. I already can't wait until the next one. Jim, Craig and Mike S were a great help around York. Not to worry, I hope you can make the next one. I think it does just that, puts faces to names, and helps to build relationships. My pleasure Emma. Thank you for coming along! Thanks for the reassurance to others, as I'm sure it's not easy rocking up to a group of people you don't know. You demonstrated that it makes no difference if you're on your own or not, you're always made to feel welcome. I'm so pleased to hear that you enjoyed it. We had some cracking discussions didn't we. There weren't many subjects that we didn't touch on. I hope you're able to make the next one Craig.